Six Flags Great America have just announced that their Batman coaster trains will be running backwards for a limited time. 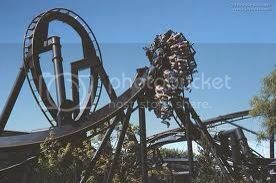 It will be really interesting seeing a B&M coaster run backwards, as I am pretty sure this hasn't been done before! Really?! Now that I got to try. A POV has been realised by Six Flags Great America of their trains running backwards. It looks amazing disorientating, and also really fun. That is insane going backwards, shame it is only going backwards for a short period of time. Oh wow! That looks fun! I have a feeling that Six Flags will see how popular this'll be and keep it for while. The thing I have just noticed about the pov that Sixs Flags has uploaded is that the back row's seats have not been fitted to the train, which also gave me the idea that the back two rows may be permanently face backwards like on The Swarm.